This week I had a super-weird support case that I would like to share. A user was plotting* from AutoCAD 2017.1 directly to his HP DesignJet Z5400 printer. This is one of those roll plotters you see in nearly every engineering and architectural office. The plotter was loaded up with a brand-new spool of 36" paper. Every time he printed to a 36" x 24" page size, the plotter ignored the landscape setting and added 2 inches to the end of the plot. In AutoCAD, verify printer Properties. This is likely part of a PC3 file. Make sure someone didn't fiddle with the paper dimensions or orientation settings. Check the page setup in AutoCAD's print preview. When this looks normal, you can rule out errors like incorrect page size, offset or scale issues. Plot to PDF First. The DWG to PDF option is not just a handy feature for daily use, it is also a valuable troubleshooting tool. If the PDF looks normal, you can usually rule AutoCAD out at this point. Plot from another program. If you get the same results from Adobe, AutoCAD, Bluebeam or some other product, signs are starting to point at the plotter itself. Check out the plotter driver settings and version. Download the latest and greatest driver for the model printer you are looking at. In the case of this HP, there was a universal postscript driver active. We installed a driver that was specific to the model of HP, but the issue persisted. After updating the driver, and not having any luck I started scratching my head. On a whim, we created a page setup in AutoCAD that was 35" x 24" (1 inch shorter than it should be). Whaddya know, it worked! No extra paper at the end of the plot. The HP cutter chopped off the page where it should have. The plot looked correct. We faked out the plotter out by 1 inch from the "x" and removed 2 inches from the "y" dimension. Even though we were happy to have a work-around, I wasn't satisfied with this as a long-term solution. Well into our second hour on the phone, the end user, (who I'll call "Bob") says, "This is a huge shot in the dark, but this is the first roll from our new paper supplier..." On a hunch, Bob grabbed a tape measure and discovered that the 36" roll of paper was really 35 7/8" wide. Then I had to Google it. Was all paper just "nominal" size or was this a paper manufacturing glitch? From my search the answer is NOPE; 36 inches means 36 inches. To see if this was indeed the root cause of the problem, Bob measured the width of the remnants of an old roll. Sure enough, the old roll was 36" on the nose. To summarize: The roll of paper being physically 1/8 of an inch too narrow was "confusing" the plotter, causing it to flip the plot 90° and add 2" to the length of the plot. Counter-intuitive** but I'm glad Bob and I figured it out. I hope this narrative helps someone in the future. Has this happened to you? Leave a comment! *Editorial note: I use the terms "plotter" and "printer" interchangeably here. ** Okay, in hindsight I suppose it makes sense...but I would have never guessed it. It is Wednesday, a day before Thanksgiving here in the US of A, a holiday where many people will be travelling to see their loved ones and share some thanks. On behalf of our entire Being Civil team I wish you a safe travel and great time wherever you may be heading. The week after that is the traditional Autodesk University which will be held in Las Vegas and for you that will be going there I also wish you the best time and pleasant trip. I will be attending AU this year and you may see me roaming around. Please feel free to stop me and have a chat if you feel like doing so. I would like to meet you and hear what you have to say. In any case, before you are off to go I wanted to share with you one thing that helped at least one customer who was having some issues starting Civil 3D. "When I try to open Civil 3D 2014 I get a fatal error: Unhandled access violation writing 0x006c exception at f3256d5ah." These numbers may vary. If you see such an error you may want to check a few things before you decide to reinstall. Likely the issue may be with the graphic drivers as this problem is often caused by an incompatible driver installed on your machine. After that you may choose to remove the /NOHARDWARE if your don't like it. Once again, happy Thanksgiving and have a great time. AutoCAD Map/Civil 3D 2014 shipped with some updates to the FDO Providers. Some of those updates were not reflected in the providers.xml file that comes with the program, so when some users run MAPIMPORT or MAPEXPORT, they get a FDO Provider ### Not Registered error message. A Hotfix should be posted soon to autodesk.com. "Could not load file or assembly System.Data.SqlServerCE version 4.0.0.0"
This is typically due to the fact that the prerequisite Microsoft SQL Server Compact 4.0 was not installed. 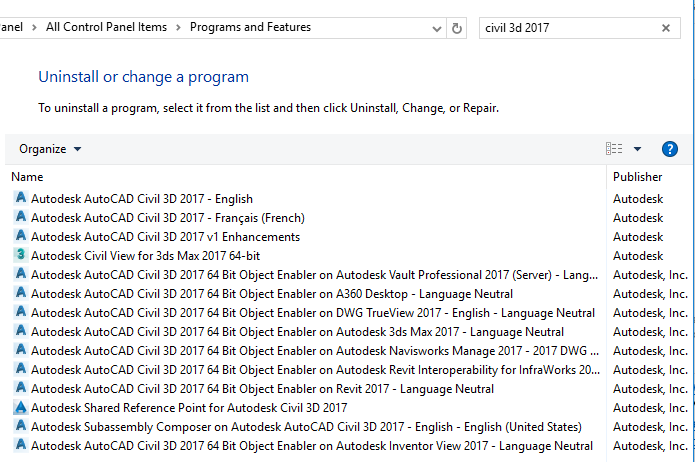 This is listed right below the actual download of the module on Subscription Center under Civil 3D 2013 Productivity Tools. Please be sure you have this downloaded and installed prior to running the Module and everything should perform as expected. Check Out features BEFORE you attempt to edit in bulk! "Please Excuse My Dear Aunt Sally." Remember that from algebra class? This memory aid is helpful to understand the order of operations required to get the correct answer when solving algebraic equations. Similarly, when it comes to working with FDO, sometimes, it's all about order of operations. 1. Connect to an FDO data source in AutoCAD Map 3D. 3. In the AutoCAD Properties Pane, try to "globally" edit the value of one attribute for all of your selected features. Sadly, even if Auto Checkout is enabled, you're just not gonna get anywhere. You'll likely have to End Process for acad.exe in Task Manager. 2. Select many features (I selected 809 points). 3. Hit Check Out (same as running MAPCHECKOUT). 4. In the AutoCAD Properties Pane, try to "globally" edit the value of one attribute for all of your selected features. Result: almost an immediate change! Finally, be sure to Check In your features by clicking the button or by running MAPCHECKINALL. Lesson: if you follow order of operations, you're almost guaranteed smooth sailing! Sometimes some issues should be classified in rather “bizarre” category if there is a tag for it. Many times hangs and lock-ups are bad signals that may be related to bad installation, application conflicts, graphic related issues or just bad files…but not always. A few days ago we have received one report from a customer who was experiencing lockups any time he tried to run OPEN or SAVE command. This customer did some homework and made sure the system is up-to-date, graphic drivers are also updated. CMDDIA and FILEDIA were set to 1 (you would be surprised how many of these we see). So, what is bizarre about this one is that the issue is not with program, installation, bad driver or whatever,... but the fact that user was running multiple screens (very common these days) gave us this wild idea. One of the common reasons for dialogs not to show up, acting as there is a lock-up while in fact program is waiting for user response, is because the dialogs are displayed off screen. Put it this way, if you have multiple screens and you have different resolution settings, you may have your screens mapped differently causing some dialogs to show off screen. So let’s see how we can check if this is the case.